At the Greater Joliet Area YMCA, our staff team works each day to have a positive effect on the lives of people living in our community. While working at the Y, many of our employees will discover more than just a job. They will find a career to thrive in and an opportunity to make a difference. 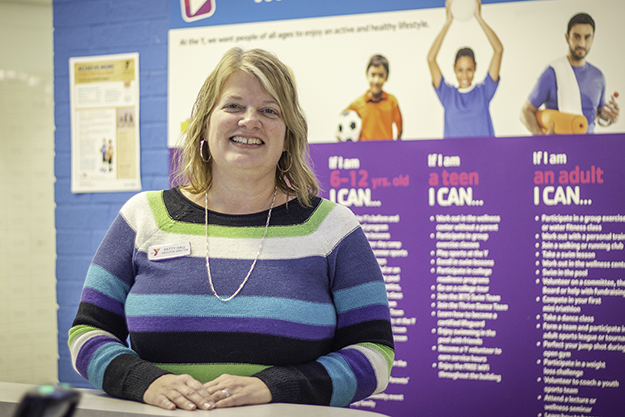 Among the many passionate employees at the Y, you’ll find Patty Hall, who began her career at the Greater Joliet Area YMCA nearly 13 years ago. Hall’s journey at the Y began in January 2006 when she responded to a newspaper ‘help wanted’ ad for a position at a new YMCA that was opening in Plainfield. In her 13 years with the Y, Hall has spent most of her time working with our membership teams, first at the C.W. Avery Family YMCA in Plainfield, and most recently at our association office. These days, you’ll find her exchanging smiles with Y members and leading the staff team as the new Executive Director at the Galowich Family YMCA. Hall: I grew up in Woodridge, IL and went to high school in Downers Grove, IL. When I married my husband, Brian, we moved around Illinois and Wisconsin, but we always managed to never be more than a short drive away from our families. Brian and I have been married 27 years and we have raised three incredible young men, Colin, Brogan and Aidan—all student-athletes. For me, it’s all about family. Q: What is your favorite thing to do when you are not at work? Hall: Brian and I spend most of our free time traveling to football and lacrosse games during the fall and spring seasons. We also enjoy boating in the summer in northern Wisconsin. Q: Can you tell us about your extensive career at the Greater Joliet Area YMCA? Hall: In 2006, I decided I wanted to be at home with my children, but also do something that involved working with the community. I decided to leave my full-time job working in the private sector—that’s when I applied to work at the Y. I knew I wanted to work at the Y because I knew it [the Y] was going to be something great. I started out as a part-time reception desk attendant at the C.W. Avery Family YMCA. Two years into my Y career, I began to help with administrative support tasks, such as running membership reports and running membership data. In 2009, I accepted a full-time position as the Membership Director for the C.W. Avery Family YMCA. In 2010, I helped with our YMCA’s conversion to Daxko, our membership and program registration software. I joined the Metropolitan Offices of the Greater Joliet Area YMCA as the Membership Operations Director in 2013. I was responsible for policies, procedures and making sure our members had a consistent experience at the Y. During my time as the Membership Operations Director, I also spent some time at the Smith Family YMCA as the interim membership director, supported the grand opening of the Morris Community YMCA, and worked with our branch membership teams to rollout the Y’s new Nationwide Membership Program. After five years of being the Membership Operations Director, I was excited to have the opportunity to take on the role of Executive Director at the Galowich Family YMCA in August 2018. Q: What goals do you have for the Galowich Family YMCA’s future? Hall: As an executive director, I realize I am the voice of Y members and staff. I look forward to working with our talented staff team to introduce new fitness programs, new adult sports programs, and new preschool enrichment programs. One of our new preschool enrichment programs, which is scheduled to launch in January, is called Tot Drop. Tot Drop is just one of several ‘perfect pairing’ opportunities we are launching in our Winter 1 session. These ‘perfect pairing’ opportunities are exciting because we will be offering classes for adults and their children at the same time. Our hope is that parents will be able to take advantage of some of our adult classes while their kids are exploring their independence and having fun in classes of their own. Q: What are you passionate about in life? Hall: I am passionate about creating a legacy and doing the right things. Whether it’s my family, the Y staff or Y members, I want everyone to have a good experience. I have said this for years, “People before paper.” The person matters more than paper. If I can make something better or easier for someone, I have left my mark. Q: Does your family have any fun Christmas traditions? Hall: Yes, every year on Christmas Eve we all choose one gift to open. This has been a tradition that my family has celebrated for many years, even when I was growing up. As a family, we also make sure we get out and volunteer. I like to show my kids the importance of doing nice things for others during this time of year. If you have any questions for Patty or just want to say ‘hi,’ her door is always open. You can stop by her office, located off the lobby of the Galowich Family Y, during your next visit or email her at [email protected].